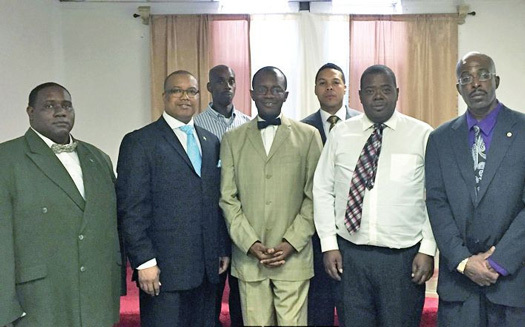 Pictured are: Brother Eric Muhammad, Brother Robert Muhammad, Brother Leonard, Student Minister Harold Muhammad, Student FOI Captain Andre X, Brother Walt and Brother James. The city of Nashville is blessed to have Brothers of the F.O.I. who have been dedicated to traveling for years down various highways to institutions in surrounding cities armed with the BOLDEST Teaching on the Planet of The Most Honorable Elijah Muhammad. These Brothers have put miles on their cars, given out Holy Qur’ans to inmates, wrote letters, accepted collect calls, taught lectures behind these institutional walls and assisted to bring peace when prison riots have occurred during their visits. In addition, our Brothers with some assistance from various Believers at Muhammad Mosque No. 60 hosted Eid Feasts in various institutions for those who observed Ramadan. Often we hear of events where policy/rules changed upon their arrival to deter them from coming ever again to see our incarcerated Brothers. Yet these F.O.I. kept going in on faith. The Nashville Prison Ministry’s Coordinator, Brother Robert Muhammad, keeps the importance of this ministry in front of the Believer’s constantly. Along with constant support from Brother Andre Muhammad, Brother Eric Muhammad and others, they make the sacrifice to ensure our Brothers within the institutions are focused on a better way of living and it has been proven this continues once they are released. They truly display to the Brothers love and concern. There are no gimmicks involved. Sunday, July 10, was an example of the genuine love, dedication and Brotherhood these F.O.I. have shown within the institutions. It was a joyous event to see some Brothers who were blessed to hear The Teachings report to Muhammad Mosque No. 60. One could tell the admiration they feel towards the F.O.I. of the Prison Reform Ministry. Each Brother was blessed and happy to be present and accepted the Teachings under the assistance of Student Minister Harold Muhammad. They were also greeted by the Student F.O.I. Captain Andre X along with the Believing community in attendance. It was very obvious no titles had importance; they are brothers; brothers in faith and brothers who will each continue on the path of Allah to the best to their abilities. Above all, these Brothers have joined forces with the Nashville 10,000 Fearless. Allah-u-Akbar!